Little Harvey Lowe's mastery of a simple, ordinary toy - the yo-yo - became his passport to a boyhood adventure that would make him a world champion. He wore proudly for the rest of his days a title won at 13. In his nimble hands, the yo-yo became more than a child's plaything. He handled the string like a puppet master, causing his yo-yo to spin, dance, and, in the nomenclature of the pastime, sleep. He claimed a repertoire of 1,000 tricks. On rare occasion, he performed a feat in which a pair of wooden yo-yos whipped within a blink of his face. He called this the death-defying Mandarin puzzle, a reminder of the toy's origins as a hunting weapon in the Philippines. As an adult, Mr. Lowe appeared on stage at clubs as one of the entertainments in an era when a venue's nightly attractions might include a half-dozen acts. He later appeared on television, most notably on the Smothers Brothers Comedy Hour, for which he wore an elaborate robe in his role as a Confucius Yomaster. It was his job to teach the venerable art to a character portrayed by Tommy Smothers called Yo-Yo Man. Away from the stage and screen, Mr. Lowe acted as an unofficial ambassador to Vancouver's Chinatown, with all its attendant mysteries. It once fell to him, for instance, to educate the actress Julie Christie in the proper technique for smoking opium. Earlier, he had become the first Chinese-Canadian to host a radio show. Willing to indulge ballyhoo to promote his craft, Mr. Lowe professed a belief in the spiritual depth of playing with a toy on a string. "There is a definite Zen spirit to the yo-yo," he once told Vancouver newspaper columnist Denny Boyd. "It's just wood and string and it occupies a tiny space in your hand. When you release it, you free its spirit and create vibrations that come back to you." Named Lowe Kwong Yoi at his birth, which occurred in 1918 in Victoria, he was the youngest of 10 children born to Lowe Gee Quai, born in China, and Seto Ming Yook, born in Victoria. His father, known as Charlie Lowe, was one of three brothers to establish tailor shops on Government Street in Victoria. The boy was raised in a household overseen by his biological mother, but the woman who most looked after him was his father's concubine, he told the Vancouver Sun's John Mackie six years ago. "Imagine, both of them were living under the same roof. But they got along good," he said. 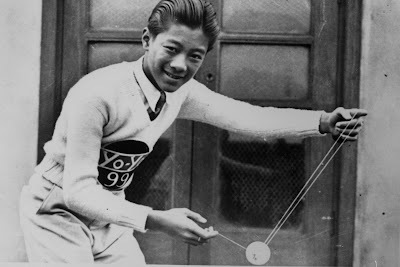 At 12, he bought his first yo-yo for 35 cents. He soon mastered the novelty, the popularity of which was promoted by neighbourhood contests. Young Harvey won these, graduating to showdowns at department stores. Continued success led to invitations to compete in Vancouver, where he again defeated all comers. Irving Cook, a Victoria promotor, took the boy overseas, as a yo-yo craze swept Britain in the Depression days of 1932. A yo-yo demonstration performed at the Derby Ball at Grosvenor House in London on June 1 was witnessed by the American aviatrix Amelia Earhart and by the Prince of Wales, heir to the throne. The Prince tried his hand at the toy. At the Empire Theatre on London's Leicester Square, Harvey Lowe faced a dozen young challengers representing rival yo-yo manufacturers in a showdown demanding skill, innovation and, as it turned out, a bit of luck. Three arrived from a distant Dominion sponsored by the Cheerio company, which was promoting its No. 99 yo-yo. They were young master Lowe and two competitors from Regina: Gene Mauk and Joe Young, the reigning world champion. In the finals, Mr. Young's string snapped, while Mr. Lowe was able to complete his performance without mishap. He was crowned world champion a month before his 14th birthday. With the crown came £1,500. Though born in Canada to a Canadian-born mother, Mr. Lowe was said to represent China in the competition. He then toured England and France. "I was wearing a white tie and tails," he reminisced six years ago. "I played at the Café de Paris, a real nightclub." During the tour, the promoter paid his mother $25 a month, while the boy received $1.25 a day in meal money. He had earlier won a bicycle, which to his boyhood eyes was the equal to having a Cadillac of his own. It was said his hands had been insured by Lloyds of London for £100,000, a fact dutifully repeated by newspapers. Left unreported was the duration of the policy, believed to have been a single day. He returned home to Victoria for high school. Then, his mother wanted her son to go to China. "You've got a Chinese face," she told him, "you've got to learn Chinese." So he joined an older married sister in Shanghai, where he studied business at St. John's University. Not long after his arrival, the Japanese seized the city, beginning a brutal seven-year occupation. He managed to skirt between two worlds as an ethnic Chinese whose nationality did not make him an enemy until December, 1941. Mr. Lowe was enlisted as a spy by Japanese intelligence, he once told Ricepaper, a Vancouver-based magazine, though he protected his friends and deliberately misled his handlers. He otherwise described a high-living wartime spent riding in Italian sports cars and going to jazz clubs. It was during the war that he became a broadcaster, reading English news reports on a station owned by his wealthy brother-in-law. He became a celebrity, his popularity peaking after the war. Mr. Lowe returned to British Columbia after the communists took over the city. A club in Vancouver hired Mr. Lowe, who by then was fluently bilingual, as a doorman. Corrupt authorities turned a blind eye to gambling by Chinese-Canadians, though not necessarily to lawbreaking by those of European ancestry. It was his job to ensure only bona fide club members entered the premises. He sought work at local radio stations. Eventually, CJOR agreed to air The Call of China, a pioneering 30-minute program that aired on Sunday afternoons. "We tried to deal with everything authentically Chinese," Mr. Lowe told a university student publication in 1985. "I might be talking about pagodas, and I'd do research on that. Between each segment, I'd play a lot of Chinese music. There were more Canadian listeners than Chinese because the program was directed more toward them." The show, believed to be the first in Canada with a Chinese-Canadian host, launched in 1951 and remained on the air for 14 years. Mr. Lowe became a prominent figure in Chinatown. In 1958, a Liberal senator referred to Douglas Jung, a member of Parliament from Vancouver, as "this Chinaman." As president of the Chinatown chapter of the Lions Club, Mr. Lowe defended the MP, noting the senator's words were "a great insult" and "objectionable because of its association with race prejudice." Mr. Lowe continued to perform with his yo-yos at such venues as the grand Orpheum Theatre and the bamboo-decorated Marco Polo, a night club for which he was stage manager. In 1971, the director Robert Altman asked Mr. Lowe to round up 100 ethnic Chinese as extras for a movie he was shooting in West Vancouver with the working title, The Presbyterian Church Wager. Mr. Lowe enlisted friends, family and restaurant customers for a scene that, alas, wound up on the cutting-room floor when the film, retitled McCabe & Mrs. Miller, was released in 1971. He is credited in the movie in a role as a townsman. It was during the filming that the actress Julie Christie, a noted perfectionist, asked Mr. Lowe to show her the proper technique for the ingestion of opium. Though he had never used the narcotic himself, he consulted old-timers in Chinatown and got the information. He later worked as an airport greeter for Canadian Pacific Airlines and, in his 70s, as a public relations representative for a mall. After he survived an operation for a brain tumour, Mr. Lowe received an outpouring of honours. The Asian Canadian Writers' Workshop Society prepared a banquet in his name in 2003 for his role as a community builder. He was inducted into the B.C. Entertainment Hall of Fame as a showman and as such has had his name imbedded in a sidewalk on Granville Street in Vancouver. A lifetime achievement award granted by the The American Yo-Yo Association bears Mr. Lowe's name. He also appeared in the documentary “Who is Albert Woo?,” a 2001 examination of the Western cultural stereotypes of Asian males by the filmmaker Hunt Hoe. Mr. Lowe was the subject of director Jason Karman’s eight-minute biographical documentary, “State of Yo” (2007). Mr. Lowe so enjoyed displaying his prowess with the toy that he continued to perform well into his 80s for the benefit of residents of seniors homes, entertaining an audience in which some members were younger than himself. Lowe Kwong Yoi was born on Oct. 30, 1918, in Victoria. He died in Vancouver on March 11, 2009. He was 90. He leaves his second wife, the former Teresita Santos, known as Tessie; their daughter Melanie Lowe of San Francisco; two daughters from his first marriage, Cindy Wang of Novato, Calif., and Vivian Wang of New York; two grandchildren; and an older sister, Aileen Wong, of Vancouver. Tom Hawthorn is a freelance newspaper and magazine writer who lives in Victoria, B.C. He writes a twice-weekly column for the Globe and Mail, Canada's national newspaper. He is finishing a book about the war experiences of the McGill University football team. It is titled, "A Greater Share of Honour."